Source: Workboats of Core Sound. Lawrence S. Earley, University of North Carolina Press, 2013. The Linda was built for John Weston Smith and named for his daughter. She operated as a "runboat" for long-hauling operations in Core Sound, but she was also equipped to shrimp, clam, and crab. Runboats are owned and operated by the seafood dealer. They evolved from similar boats called “buy boats.” In the late 19th and early 20th century, buy boat captains met fleets of fishing boats out on the fishing grounds and bought the catch directly from fishermen, weighing it on large scales. This was a widespread practice in the Chesapeake Sound region as well. Eventually seafood dealers centralized services to fishermen, providing ice, fuel, and packing capabilities. Runboats replaced buy boats, although the terms are used interchangeably. Runboats meet the fishing boats on the fishing grounds and, using a large dip net, scoop the fish from the nets and transport the fish back to the packing house so that the fleet can continue to fish. The fishing boat captain settles up with the fish house later. 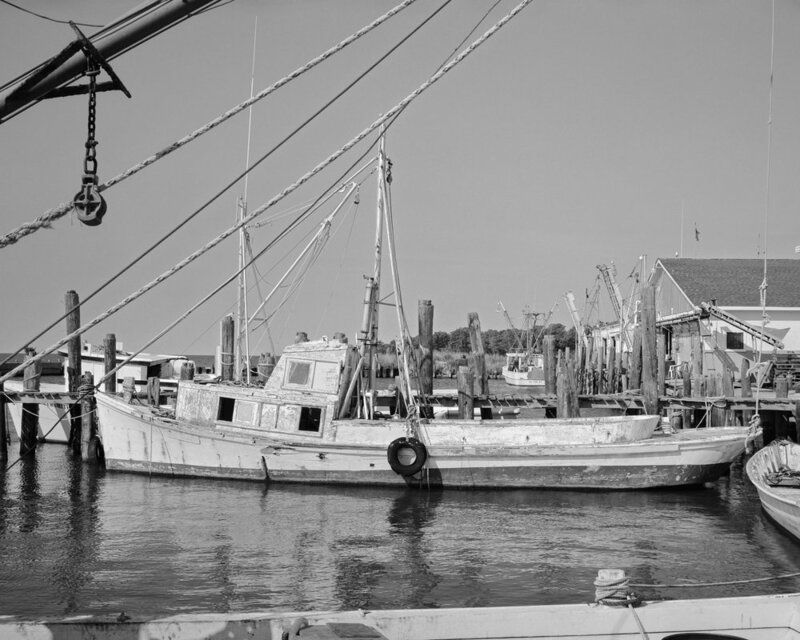 Linda was a runboat used in the long-haul fishery, a method especially prevalent among fishing crews of Atlantic, Sea Level, Stacy, and Cedar Island. Long-hauling requires two 40-foot vessels, called haulboats, that pull the opposite ends of a long net in a horse-shoe shape from deeper areas of the sound to shallow shoals. In the shallow water, the boats eventually crisscross, creating a large loop of net containing the fish. The fishermen, who get overboard in chest-deep water to "foot" the net, ensure that the fish do not escape. Sections of the net are gathered and fed into the skiffs as the runboat approaches to remove the trout, croaker, spot, and other fish. A runboat has two compartments—one for the fish and the other containing the ice that will keep the fish fresh until it can be brought to shore. The runboat captain uses a bailing net to lift the fish from the fisherman’s nets and spill them into the runboat’s open hatch. The fishermen ice the fish down with shovels. Atlantic was the center of the long-haul fishery during its twentieth-century heyday. About a dozen crews of six men from the Atlantic area operated simultaneously in Core Sound, although the numbers had shrunk to a single crew by 2016. Clayton Fulcher Seafood Co. operated many runboats, among them the Muriel, the Bettie E., the Harry B., the Genevieve, the Marion A, the Capt. Clayt and the Miss Bettie. Most of these runboats were built by Ambrose Fulcher. The Bettie E. was known for her daily runs from Atlantic to Hatteras and back. Replaced by bigger runboats by the end of the century, the Linda gradually went to pieces. Her bilge pump failed in 2007. In 2011, she was destroyed by Hurricane Irene while at the dock.